Hanoi’s “cơm bình dân” joints are some of my favorite restaurants in the city. The name loosely means “common people’s rice” and, I don’t even know where to begin for a description. Imagine a bunch of well, common people, just like me clustered around a flimsy table groaning under the weight of pans, bowls, and plates of various vegetables, meats and usually a tofu based treat. Whereas in Saigon we have the same in glass enclosed rolling food carts, Hanoi just spreads it out like a mini buffet. 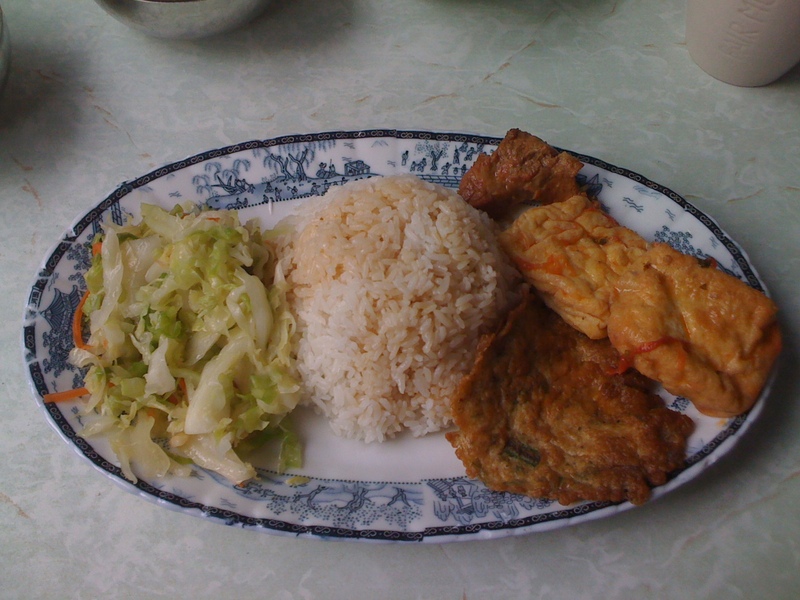 A giant scoop of rice lands on a plate and the hungry merely point to whatever selections look good. The norm is a meat and a couple of vegetables. Some unsweetened ice tea and soup arrive along with the plate and it’s a cheap feast for about a buck fifty. Follow the office workers and you can’t go wrong. But unlike Saigon, dining in Hanoi is highly regimented in terms of meal times. If a hungry diner were to brazenly arrive outside of the accepted lunch hours of noon to one, the food infrastructure is taxed to its breaking point. My friend Michel wanted some street com binh dan style street food before we headed to the airport which could prove a gastronomical nightmare for the weak of stomach if food is chosen unwisely. Wanting to of course play it safe, I suggested one of the three street food joints at 49 Xuan Dieu Road (Tay Ho neighborhood) all under one roof but separated by concrete walls. These all share in common open fronts, no climate control, and no nothing in terms of creature comforts, and Café Chi Em has filled my belly off and on for two years now without incident. Much to my surprise this joint now offers a com binh dan spread in addition to the soup and fried noodle standards. I had arrived thinking this would just be a lunch of boring bun bo nam bo, which I do like by the way. But it’s just that something new each day is always a welcome addition to this journey across Vietnam one bite at a time. Faced with a sudden plethora of unexpected treats, I just could not make up my mind. So I took the easy way out by pointing to a guy’s plate and asking for “same, same.” Three of the staff rushed over to his plate and scared him a bit as they descended their faces down into his plate. Hey, get over it mister is what I have to say to that. People stare at me very closely all day long so he is just getting a taste of my world! I silently applauded how they elevate rice beyond a normal hunk of steamed grains by roundly shaping it with a bowl just like the lunch specials at a Chinese place in the US. My lunch of perfectly seasoned omelet, perfectly cooled tender braised pork, tofu and vegetable hit the spot. 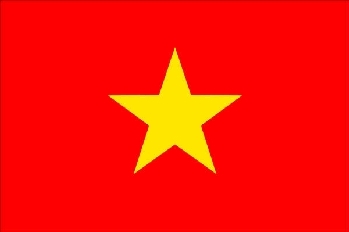 My mind was already busy plotting out all the mix and match combinations possible for future trips to Hanoi. Eating with the “common people” over some rice is pure heaven for me.